Deborah J. Guerrero MSW (Tlingit, Snohomish, & Cowlitz) is a social worker at Muckleshoot Indian Child Welfare in Auburn Washington. She is an activist and community organizer. She serves as a Board of Director for several Indian Organizations in Seattle. She is a ceremonialist and has a deep passion for Traditional Indigenous Healing ways. 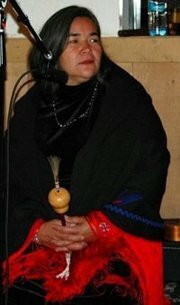 She is an active member in the Native American Church, and is the proud parent of three grown children. She is a co-founder of Turtle Women Rising. Turtle Women Rising invites you to support this Stand For Peace in Olympia. This entry was posted in Make No Bones Shows and tagged 2011, Connecting with Spirit, Deborah Guerrero, First Nations, Honoring, Indigenous, KAOS 89.3 FM, Make No Bones About It, October 7th to October 11th, Stand For Peace in Olympia Washington, Turtle Woman Rising. Bookmark the permalink.